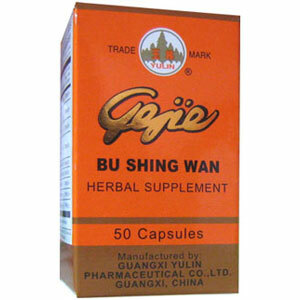 Ge Jie Bu Shing Wan is a popular and well-known herbal supplement that supports the health of the internal organs and helps maintain general well being. This has the special function to strengthen kidney yang and congenital jing. Tonifies the lung yin, strengthen Qi and nourishes the blood. Nourish kidneys, strengthen kidney yang and congenital jing. Tonifies lung yin, strengthen Qi and nourishes the blood. General weakness, weakness due to long illness, or during a chronic disease, overfatigue due to excessive work, degenerative conditions, over-urinating, lumbago due to deficiency of the kidney and liver, difficulty breathing, chronic cough (with or without phlegm). Take 3 or 4 pills, 2 or 3 times a day, around mealtime.